Ceausescu’s last push to pay off the national debt lead to some of the most drastic austerity measures in times of peace. Food rations were an essential part of the plan. Coupled with electricity and heating shortages as well as with an iron fist in dealing with any sort of political dissent, the humiliations that Romanians had to go through were utterly complete. The violent outburst of December 1989 came down rather as a natural effect of this austerity. 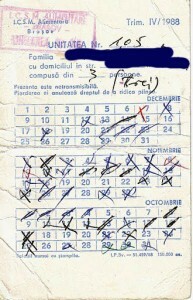 The photo depicts bread rations of a East-Transylvanian family of three in the last trimester of 1988. The ration per person was roughly 250 grams a day. The tickets were non-transmittable, “losing it annuls the right to get bread”. Rationing of bread was introduced in 1982 and the communists prepared it gradually through the adoption of several laws aimed to formalize reduced food portions. On December 19, 1980 the “Law for the creation, distribution and use by counties of resources for population” was enforced. The law, in fact a decree, stipulated rationalizing food consumption by each county. Flour, sugar and oil ticket cards were differentiated on categories of the population. Larger cities were getting bigger rations while smaller ones were given to rural peasants. The process by which Ceausescu intended to reduce food rations at the edge of survival, followed a scientific program created at the request of specialists from the Party’s Central Committee. In 1982 it came out with the “scientific diet program for the population,” which established the calorie intake needs, including food rations and weight standards for individuals – a purely Nazi piece of legislation. By decree, in 1984 a new and lower food standard was adopted. Romanians were annually entitled to 39 kg of meat, 78 liters of milk and 166 kg of vegetables. Oil and sugar were given once a month, the ration was one kilogram. Rations were lifted on Christmas Eve 1989, a couple of days after Ceausescu and his wife fled the Central Committee in a helicopter. Next day, on Christmas, they were caught, mock-tried, and executed by a military firing squad.